This page describes how to use tenant tags to make working with tenanted deployments in Octopus much easier. Working with a small number of tenants is quite easy, they all fit on one page, and you can tailor deployments for your projects and environments based in individual tenants. Working with a lot of tenants (we hope all of our customers are this successful!) is much harder if you try to tailor everything based on individual tenants. This is where it makes sense to work with tenants in aggregate, just like environments and target roles let you work with machines in aggregate instead of individually. Consider the example of setting up new infrastructure as a shared host for multiple tenants: Instead of specifying each tenant by their name, you could tag each tenant as belonging to a shared pool, and add that single tag to each deployment target in the pool. You can jump ahead in our guide if this is of interest to you. In the example above we are configuring a single deployment target for each tenant individually - what a headache! In the example above we are configuring a single deployment target for a group of tenants using a single tag - what a dream! Let's walk through an example of classifying our tenants by some measure of importance which will help us group our tenants, and find them more easily. Step 1: Create a tag set and tags. Step 2: Tag your existing tenant. Step 3: Tailor the deployment process for VIP tenants. Step 4: Deploy the project to your VIP tenant. Step 5: Create and tag some more tenants to see the results. Let's create a tag set called Tenant importance with some tags that represent different reasons why we might treat one tenant differently to others. Go to Library ➜ Tenant Tag Sets. 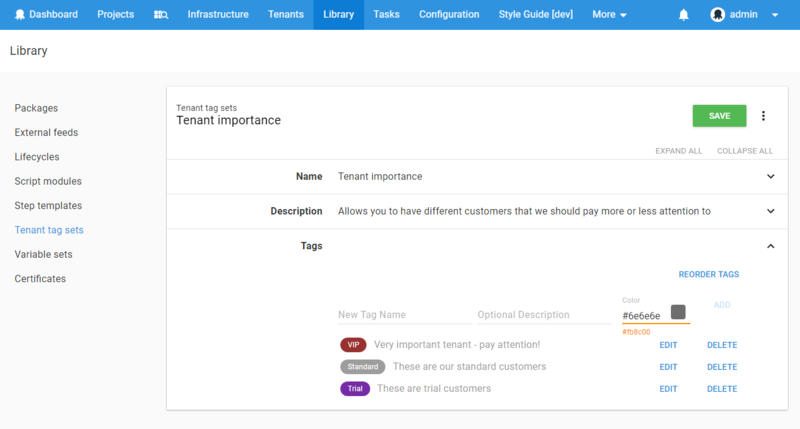 Create a tag set called Tenant importance with the description: Allows you to have different customers that we should pay more or less attention to. Now add some tags to your tag set using these examples as a guide. Let's tag your existing tenant to see how easy it is to work with tags. Find your tenant, our example, Beverley Sanchez and tag them as a VIP, remembering to click Save. That's it! When you navigate to the tenant's overview page, you'll see the tags you've applied to them. Let's modify the deployment process so we provide our VIP tenants with a custom email announcing a new deployment. Write-Host "Email to $contactEmail - Hi $tenantName, just wanted to let you know we've upgraded $projectName in your $environmentName environment." Modify the step to make sure it is only executed when deploying our project for VIP tenants. Clicking the Design/Preview link will open a dialog to help you design your tenant filter. You can learn more about designing complex tenant filters in our reference documentation. The resulting deployment process will include the step that emails tenants tagged with the VIP tag. Now this new step in your deployment process will execute when deploying to VIP tenants, but not for any other tenants. To really see the benefit of tagging you could go and create some more tenants and tag them. On the tenants page you can click SHOW ADVANCED FILTERS and view your tenants based on which tags have been applied to which tenants. Learn about designing a multi-tenant upgrade process and designing a multi-tenant hosting model which all use tags as a fundamental building block.